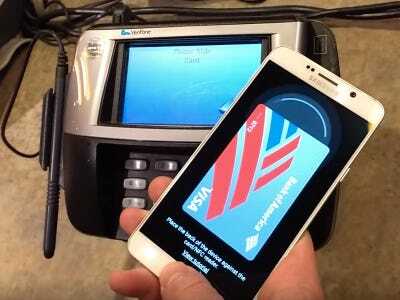 Samsung may not be the first phone company to test mobile payments, but a key technology gives it the edge. It’s called MST and it makes your phone look like a big credit card to a store’s conventional credit card reader, so it will work in pretty much any store where you can use your credit card. 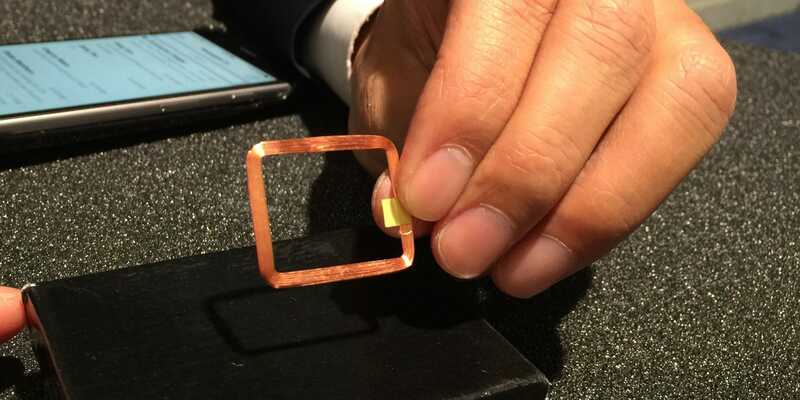 MST stands for “magnetic secure transmission,” and only Samsung phones are currently using MST for its mobile payment platform called Samsung Pay, which launches September 28 in the US. 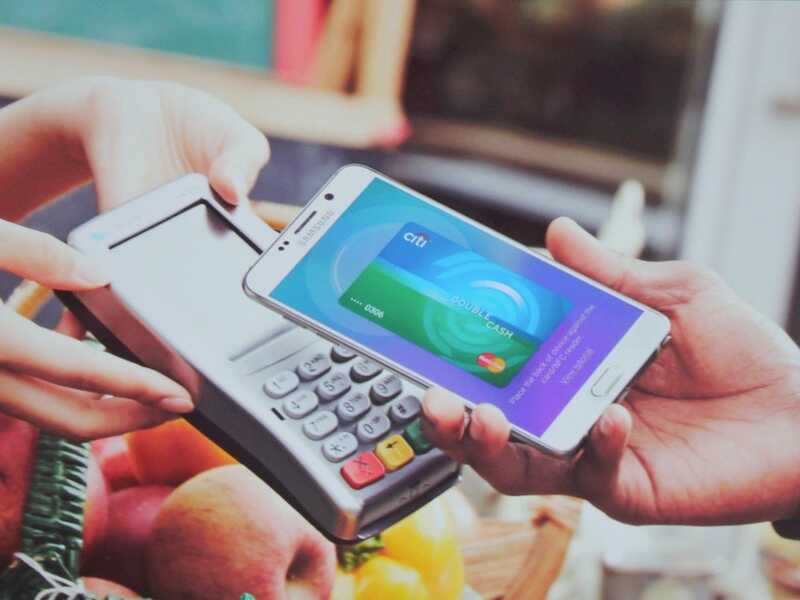 To help explain how it works, Tech Insider spoke to Will Graylin, CEO of LoopPau, the company Samsung bought to make Samsung Pay possible. Graylin said the technology involves a tiny metal coil bent into a loop. When electricity passes through the coil, it creates a magnetic field that can talk to standard magnetic credit card readers. “It emulates exactly what happens when you swipe a card in terms of transmitting data,” Graylin said. So, when you hover your phone over a credit card reader to pay with your phone, MST is “talking the language of the point of sale,” as Graylin puts it. Business InsiderAn example of what one of the LoopPay coils looks like. LoopPay’s MST technology is older than the NFC (near-field communication) technology Apple and Google use for Apple Pay and Android Pay, respectively. But NFC is at a disadvantage. For one, NFC mobile payments are nowhere near as widely accepted as MST mobile payments because only newer credit card readers are outfitted with NFC. That means a very small fraction of retailers you visit will be able to accept Apple Pay or Android Pay. Antonio Villas-Boas/Tech InsiderThis reader may or may not have NFC, but it’s not clear at all, so I’m going to use MST, which I know it accepts. What’s more, there’s little or no incentive for retailers to upgrade their terminals if they don’t have NFC. In fact, it would cost retailers with multiple store locations a lot of money to upgrade just to give customers the option to use NFC mobile payments. It would make sense to upgrade if people were ditching their wallets for their phones, but they’re not. You can’t store things like ID cards or public transit passes with any mobile payment platform. So, MST wins out here because it doesn’t need retailers to upgrade their terminals. Then, there’s the uncertainty a customer faces of whether or not a store accepts mobile NFC mobile payments. There’s little difference between a reader with NFC and one without. You have to check for the tiny affirming symbol on the payment terminal’s screen, which is an extra step that people aren’t willing to adopt, especially when using regular credit cards isn’t a problem that needs to be fixed. It’s part of the reason why Apple Pay adoption is decreasing. AppleApple’s website asks you to look for these symbols on the payment terminal, which isn’t something many people are willing to do. MST, on the other hand, doesn’t require you to check whether or not the store accepts it. Samsung promises that 90% of retailers accept Samsung Pay. That’s essentially a 90% chance that you’ll be able to pay with your phone at the next store you walk into. In fact, many stores probably won’t even realise that people can use their MST phones to pay. While that kind of wide acceptance is great, it does pose some problems in certain situations. When a store has cashier-facing payment terminals, you can’t hand your phone to the cashier like you would a credit card because you need to use your fingerprint to make the mobile payment. And reaching over the counter towards the cashier is an awkward experience for both the cashier and the customer. MST won’t be replacing wallets either because, as mentioned above, you can’t store the other cards you might carry around in your wallet, like a driver’s licence or public transit cards. And there are still many stores that only accept cash. So far, the only phone with MST are Samsung’s latest crop of flagship devices, including the Galaxy S6, S6 Edge, S6 Edge+, and Galaxy Note 5, all of which have the MST hardware built into them. According to the Korea Herald, which spoke with Samsung head of mobile JK Shin, Samsung will include MST technology in other Samsung smartphones, not just the flagships. And at the moment, Samsung Pay has only partnered with four banks in the US, including American Express, Bank of America, Citi, and US Bank. However, that number is sure to rise as Samsung Pay starts rolling out on September 28.